As parents, there are a million things we need to do each day. For our kids and for ourselves. We start each day hoping it gets off without a hitch, so everyone gets to school on time! In our house, this has a lot to do with what the kids wear. In order to avoid a meltdown, there needs to be a quick turnaround on the laundry. We don’t want anyone missing their favourite shirt or pants! We try to be as efficient as possible in our everyday life, so we need efficient laundry machines to support us! Why would a shirt be missing, you ask? Why the LG SideKick™ will be the answer to your prayers (and get rid of the mom guilt)! The LG SideKick™ is a pedestal washer that replaces the kickstand under the washer. Parents, mark my words, this is a dream come true! The LG SideKick™ gets you as close as possible to having clean laundry all the time! 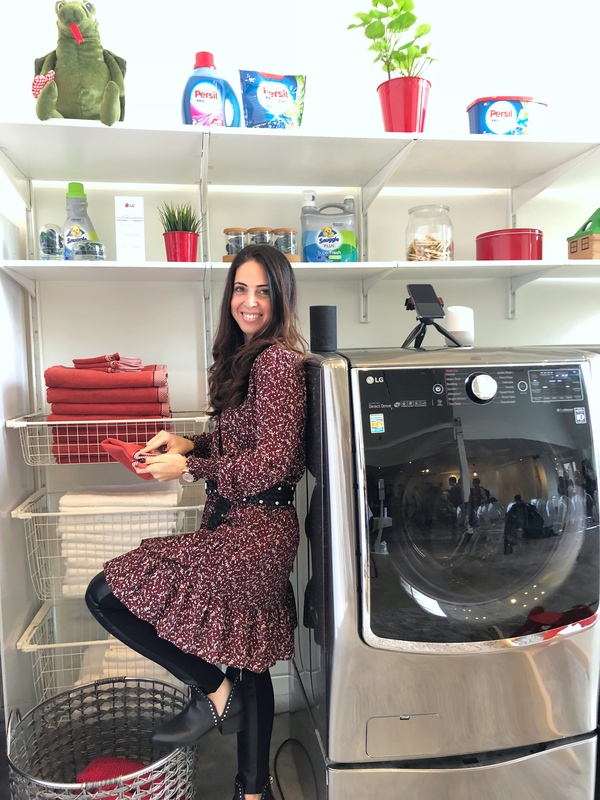 For example, as I walk up the stairs to put away the clean laundry and see my kids walk through the door with their dirty clothes on, I simply whip their two outfits from the day into the LG SideKick and I don’t have to stress about the excess water I’m using to clean such a small load since it uses less water than a regular load. My kids don’t have to panic the next morning when they wore their red shirt on Monday only to find out that red shirt day at school is on Tuesday. It’s a win, win for parents and children! Efficient Laundry Machines are extremely helpful! Let’s talk about being efficient. We need to be efficient each and every day as parents. We need to make every minute count so that we can get everything done from school drop offs, to work, to organizing meals and everything in between. There is nothing worse than over stuffing the washing machine and not getting a good clean. With the LG SideKick™, you can now do one and a half loads at the same time. You can do a regular small load in the bottom. You can separate all your delicates and put the LG SideKick™ on a delicate cycle while using the main washer on a regular cycle. The options are endless. If you just have a few things to wash, like baby onesies, or in our house, snack bags and lunch boxes or a stuffed animal, you can just run the LG SideKick™ on its own! The LG SideKick™ is just as efficient as we are! A washer and dryer as SMART as everything else! In this day and age, you barely need to be in the laundry room to get the laundry done. Everything can be done from the touch of a button on your mobile device. How many times have you thrown in a load and then forgotten to run down to the washer later on to move it over to the dryer? I have done this more times than I can count! Now, with the help of the LG SmartThinQ® app, you can do it all from your phone! Select a cycle, start the wash—or stop it to get dad or someone else in the house to throw in a missing garment. You can even get notifications about when your laundry will be done, all from your smartphone. 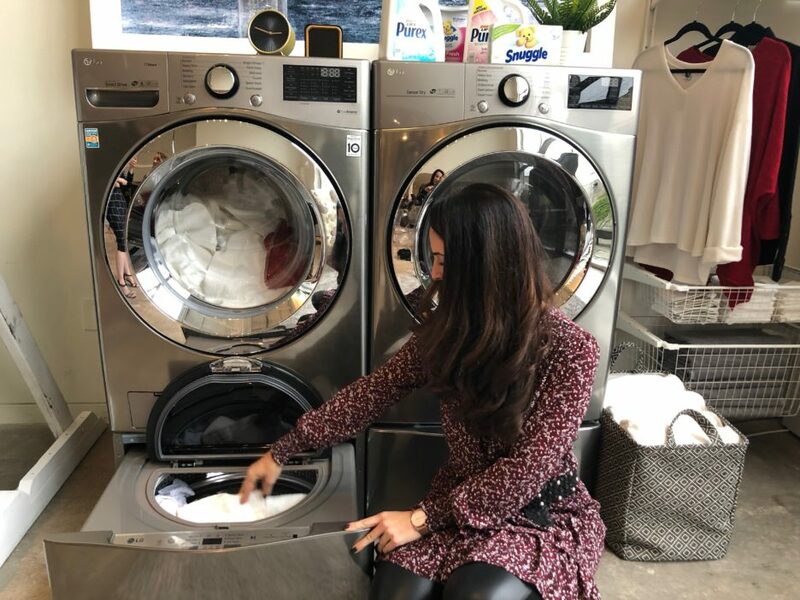 To make things even better, it works with the Google Assistant and Amazon Alexa, so you can manage your laundry with simple voice commands. No need to worry if your hands are full, or you’re in the other room. The LG TWINWash is efficiency at its best, every parent’s dream! Get ready for us to blow your mind! 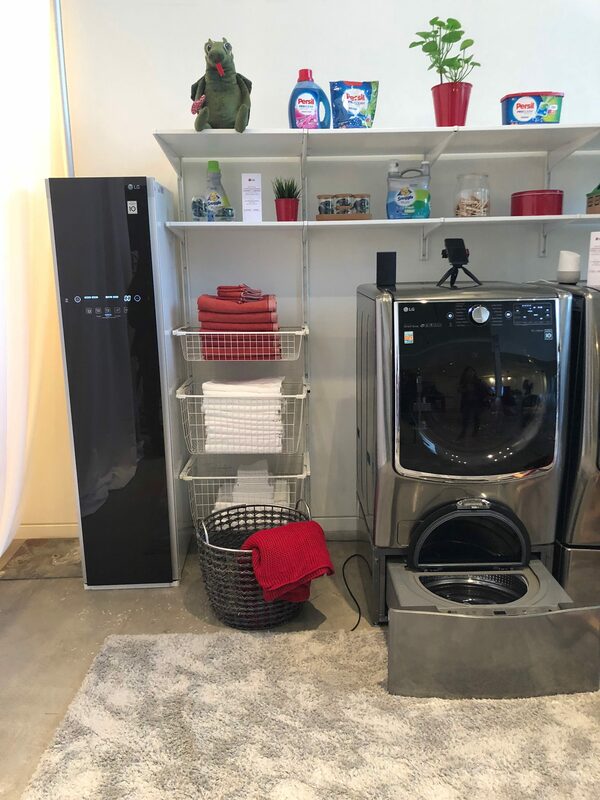 While many parents may dread doing laundry, you are going to love the LG Styler! 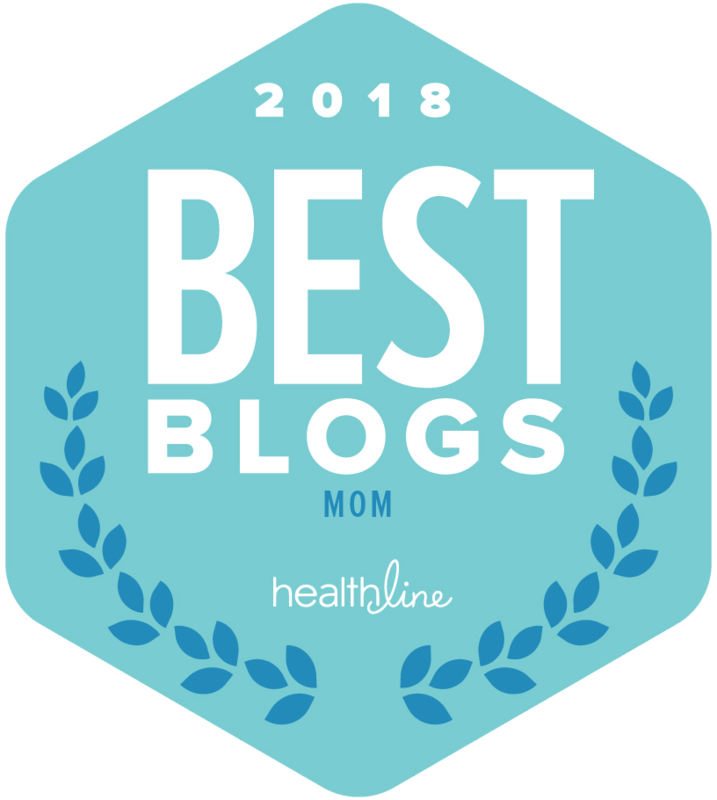 We are obsessed with this and so are our husbands! 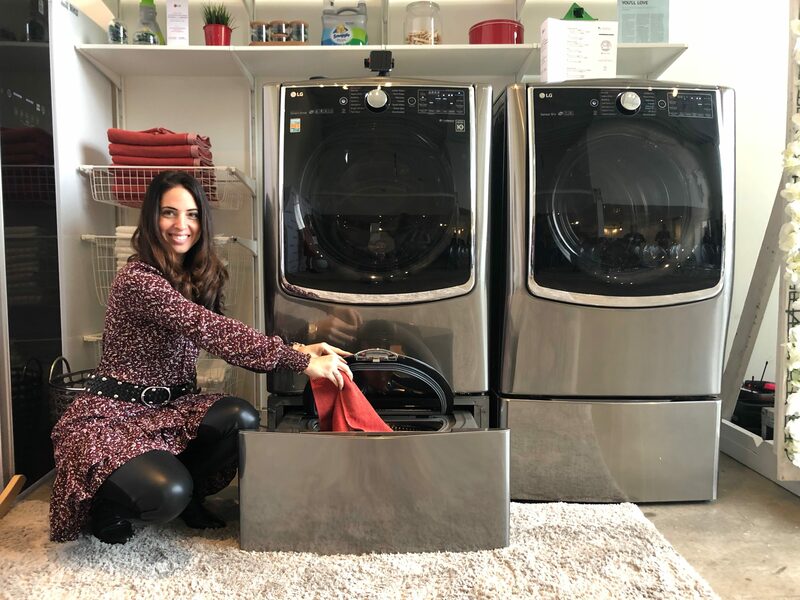 Say goodbye to frequent trips to the dry cleaners and hello to refreshing and sanitizing at home! The LG Styler is slim and efficient! Throw in your husband’s suit to de-wrinkle and freshen up. Sanitize that class bear that goes from house to house without worrying about ruining it! The LG Styler will change your life…it has most definitely changed ours. What makes your laundry room the Ultimate Laundry Room?